Binary options are the hot trend in the world of investing. Their simplicity and the low entry barriers to trade make them accessible to many people who would never have been able to trade in the past. When you see that you can get started with $100 and that it only takes three quick clicks to place an order, it can be tempting to send in your money and get started right away. No matter why you are trading though, it can be helpful to pause for a moment and go over your beginner’s checklist—everything you need to be sure you have in place before you start trading live and risking real money. Not every item on this list will necessarily apply to you. It depends on whether you are trading for fun or trading seriously. 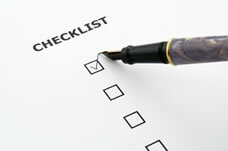 But many of these checklist items will apply to everyone. I will explain which items should concern you if you are trading for fun and which ones you do not need to worry about. 1. Have you researched and picked a trustworthy binary options online broker? This step is important for everyone. If you are trying to trade for a living, it is an absolute must. It is still very important if you are trading for fun, though. You would never want to spend money at an online casino which you did not trust. Trading binary options online is no different. Make sure you choose a company with a strong reputation and great service. Our will get you started. 2. Do you have a money management plan? This is another step that every trader needs to take. If you are trading for profit, you will not get very far in that direction unless you are trading a responsible amount of money and you keep it consistent with each trade. If you are trading for fun, think about managing your trading account like . Whether you win or lose, you will be able to have more fun if you are able to stretch your bankroll. 3. Do you actually have enough money to trade? After you have figured out your money management plan, ask yourself how much money you would actually be making on your winning trades. If the number is not particularly high, you may want to simply keep on testing until you actually have the money you need to make more than the minimum deposit. If you have more to deposit, strongly consider doing so. That way you can profit more quickly without changing the percentage of your account you invest. A moment should be taken to discuss the matter of bonuses. Bonuses are usually offered in the form of trading leverage. In other words, you are able to trade more money than you have in your account, and profit or lose more quickly than you could without the bonus, but the bonus will only be awarded to you as real cash after you reach a certain turnover in your account. Bonuses can help you out with a lack of funding, but they can also cause you to blow your account more quickly as well. Whether or not you use them is at your own discretion. Even if you are trading for fun, you should think carefully before accepting one, since it may run you through your bankroll faster than you would like. 4. Do you have a trading system? This question is mostly in place for traders who are trying to trade seriously, since a system is what you use to try to reduce your exposure to chance and risk and bring order to your trading. Without a system, it is absolutely impossible to profit as a binary options online trader for long. If you are playing the markets mainly for entertainment, it is not particularly important for you to have a trading system, unless of course you want to. In gambling terms, you can think of it as the difference between playing roulette or slots and playing poker. If you want your experience to be more like poker, a combination of luck and skill, then you will need a system. If you enjoy your fate being left entirely up to chance, then you do not need one. 5. If you do have a trading system, have you tested it successfully? It is one thing to have a system which worked for someone else, and quite another to have one that works for yourself. Why would a trading method work for one person but not for another? There are a ton of different factors involved, not the least of which is you, your own perception, and your own trading habits. An untested system is as big an unknown as trading the market without one. Make sure you take some time to test your system on historical and current data (backtesting and demo testing). Only once you have been profitable with both should you even think of trading with real money. One or two test trades does not constitute profitable. Do several dozen at least, preferably more like fifty to two hundred , and try to trade profitably in demo for a few weeks or months, depending on how many trades you actually do within a given week. Again, this is not an issue if you are not serious about trading profitably and just want to have some fun. 6. Are you in the right mindset? This is one of the most important aspects of binary options online trading, and also one of the most often overlooked. Even if you have a great trading method and you have tested it successfully, you will not get far if you trade when you are anxious, stressed out, desperate or even feeling conceited. Testing usually takes care of a lot of these emotions, but it is also up to you to keep yourself in check. Also make sure that you are feeling all right physically. Trading while exhausted, in pain, or otherwise distracted can also take a toll. whether in life or in trading binary options online. Нашел в интернете нужный блог на тематику kamod.net.ua.